Proper disposal of sensitive and personal documents is one of the best ways to protect your private information. Whether you’re searching for a shredder for a home office or a business, you’ll need to know how different models stack up, so you can make an informed decision. Our experts researched and reviewed the best shredders on the market to bring you a top ten list. Before you get to shopping, you’ll need to know what to look for. Let’s get started! Child safe: If you have little ones at home, you’ll need to make sure they’re protected. This spec will let you know if the model you’re eyeing is child safe or if you should keep searching. Sheet Capacity: Check this spec to determine the number of sheets you can run through the shredder at one time. If you have large scale needs, you’ll want to know your model can handle them with ease. 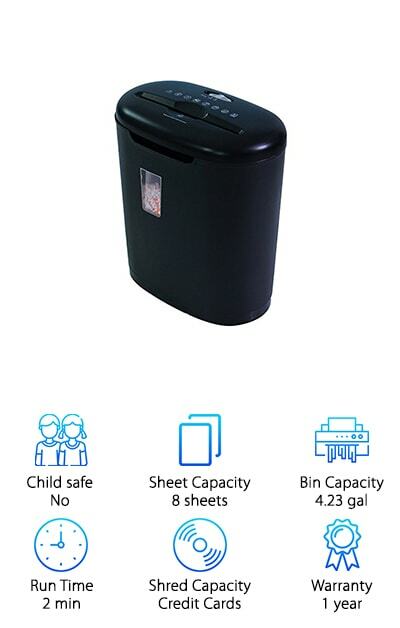 Bin Capacity: If you have a lot of shredding to do you’ll want a bin that can handle everything, so you aren’t constantly emptying it. Check this spec for the bin capacity in gallons. Run Time: Run time is the length of time the shredder can run before it needs to be turned off. Check this spec to determine the amount of time in minutes that the shredder in question can go before it needs a break. Shred Capacity: If you need a powerful shredder that can slice through credit cards, DVDs, or other tough materials, check this spec. We’ll let you know if the model is limited to paper or has the capacity to shred other materials. Warranty: When you make an investment you want to be backed by a good warranty. This spec tells you the length of time in years that each shredder is covered by a manufacturer’s warranty, so you can rest assured you’re covered if something goes wrong. Now that you know what to look for, it’s time to check out our top ten list. We’ve brought you a wide selection, so you can pick the best shredder to meet all of your office and personal needs. Each of the options offers a range of features, you just need to pick the ideal model for your setting and requirements! We’ve handled all the details and put them in an easy format for your viewing to make the task easier. Happy shopping! Our top pick, the Fellowes PowerShred lets you shred in style with its SilentShred quiet performance, ideal for shared workspaces and sensitive environments. This 100% jam-proof system keeps things moving swiftly and helps you power through heavy jobs. The Fellowes can handle up to 16 sheets of paper at a time and has the capacity to shred credit cards and discs, such as CDs and DVDs. 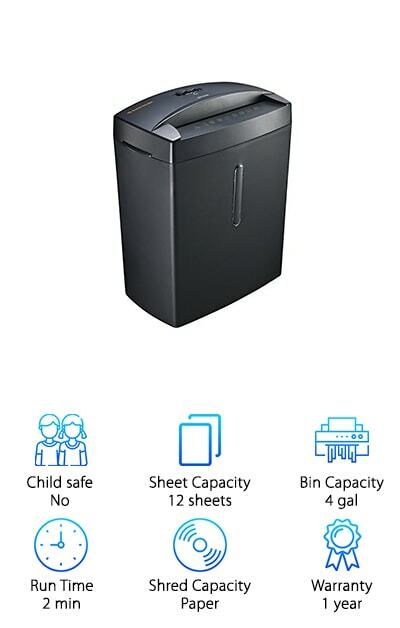 Its wide range of shredding abilities and run time of twenty minutes make it our pick for the best commercial paper shredder. Designed as an energy efficient system, the Fellowes saves you on operating costs and won’t strain your power supply. 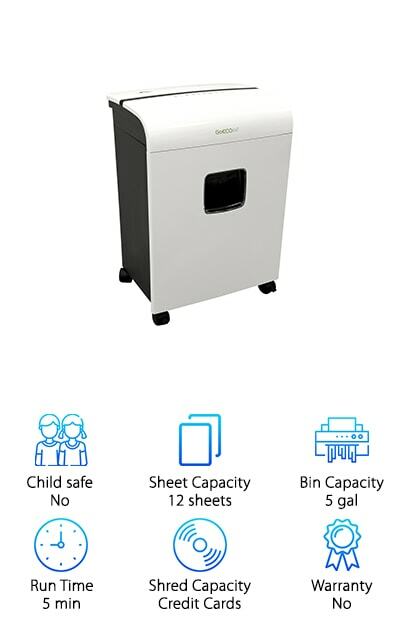 It is equipped with technology that stops the shredding process when hands touch the paper opening, making it child, pet, and accident safe. With a two year overall warranty and a five-year warranty on the cutter, the Fellowes comes to you at an amazing price and should not be overlooked. The Bonsaii shredder makes the list as our favorite budget pick. 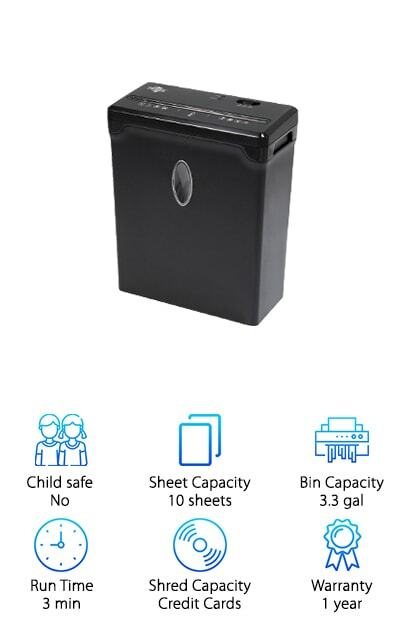 Available in three different paper shredding capacities, including 6 sheets, 8 sheets, or 12 sheets, this compact, budget model is ideal for a home office. Equipped with an overheating protection system, the Bonsaii allows you to shred all of your personal information for two minutes before needing a cool-down period. Convenient handles on each side of the machine provide a way to easily lift and empty the 4-gallon wastebasket when shredding is complete. The auto start and manual reverse features work to efficiently clear paper jams, saving you frustration. 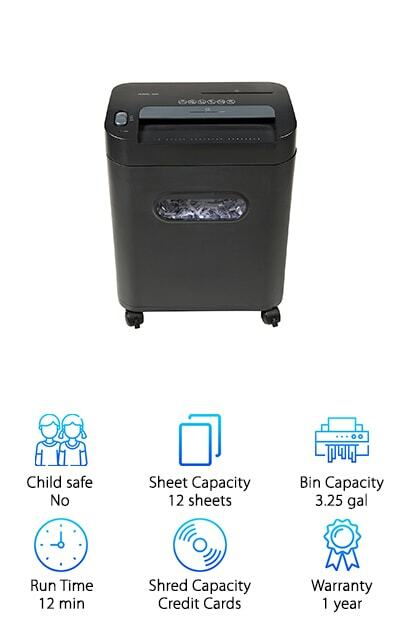 Shredding at an amazing 6.2 feet per minute into tiny particles, our experts agree that the Bonsaii is in the running for the best shredder for home use. What’s more, this affordable model comes complete with a one year warranty. If your shredding needs are restricted to paper, the Bonsaii is an ideal choice. Specifically designed as a compact, cross-cut model for personal use, the Swingline is our pick for best home office shredder. With powerful cutting capabilities that can handle mail, paper clips, staples, credit cards, and discs, Swingline meets all of your shredding needs. Shred up to 12 sheets at a time and watch as they shrink into small, cross-cut squares ideal for your security needs. A standard letter-sized sheet of paper easily shreds into more than 400 pieces! But that’s not all! The Swingline can also shred your old credit cards, DVDs, and CDs through a separate cutter, preventing damage to the main cutters and promoting longer shredder life. This duo shredder technology is an excellent addition to any home office or small setting. It is equipped with a lift-off handle that allows you to easily empty the 5-gallon bin when shredding is complete. A cool down indicator alerts you when it’s time to power off. A good value at a great price, Swingline delivers the features you need! Compact, cheap, and perfect for occasional shredding in a home office, the Aurora Strip-Cut can handle six sheets of paper or one credit card at a time. Equipped with thermal overheat protection for preservation and an auto start and stop feature, the Aurora is easy-to-use and manage. Paper jams don’t stand a chance, thanks to the manual reverse feature. If you’re in the market for a simple shredder without a wastebasket attached, you should check out Aurora. This model cuts paper into strips, effectively destroying any sensitive information that you’d like to keep personal. 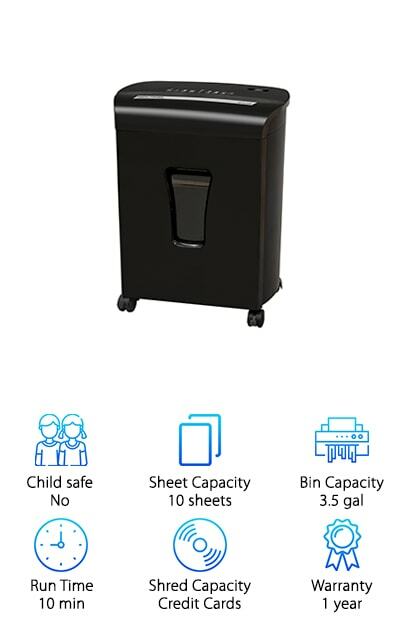 The best part is that it features an extendable arm that fits over most wastebaskets, giving you the option of attaching your own trash can for mess control. On the market for a great price, if your budget is tight and your shredding needs are minimal, the Aurora is the perfect pick for you! If you’re seeking the best heavy duty paper shredder for a home office, the Royal 112 MX has you covered. This cross-cut shredder is capable of shredding CDs, DVDs, and credit cards with ease. Able to handle 12 sheets of paper at a time and using an auto start and stop feature, the Royal turns your private information into tiny, unrecognizable pieces. Separate slots on the machine are designed specifically for plastic, allowing you to preserve the paper shredding cutters. A powerful ½ horsepower motor completely destroys all your sensitive paper and digital information, helping you avoid identity theft and letting you rest easy. Royal has been manufacturing office equipment for more than 100 years and guarantees quality, which is evident in the way the 112 MX Shredder performs. And get this: the shredder comes with wheels for easy mobility and the pull-out basket helps you empty shred for easy clean-up. Able to handle 10 sheets of paper or one credit card at a time, the Sentinel makes our list with rave shredder reviews. It uses a micro-cut shred for top-rated security, effectively destroying your personal information and turning it into unrecognizable tiny cubes. Even the best identity thief wouldn’t be able to piece these papers back together! Ultra-quiet, this shredder is ideal for small or home offices. 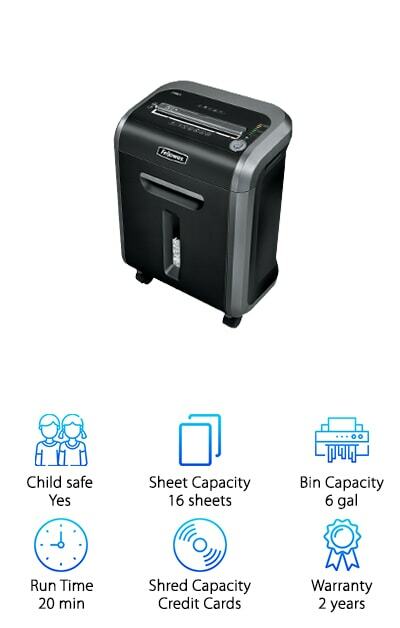 Its ability to shred plastic cards makes it practical for those in the market for a multifunctional shredder. Capable of shredding 7.2 feet, or 72 pages, per minute, the Sentinel comes equipped with a manual reverse function to keep paper jams at bay. A 3.5-gallon slide-out wastebasket with a window makes for convenient cleanup. Available on wheels, the Sentinel effortlessly glides from room to room or office to office, making sharing simple. Excellent quality at an excellent price, you shouldn’t overlook the Sentinel if you need a reliable shredder that meets most of our specs. The HSM ShredStar is a powerful shredder designed for small offices with heavy-duty shredding needs. Able to cut through 158 sheets of paper per minute, this elite model also shreds credit cards, discs, staples, and paper clips. Load twenty sheets of paper at a time and watch them be reduced to 430 confetti-cut pieces per page. But here’s the kicker: the HSM doesn’t need any downtime, meaning it can run continuously until all your shredding needs are met. This feature certainly sets it apart from the competition! ShredStar’s JamStop technology stops jams from occurring, even when the machine is overloaded. 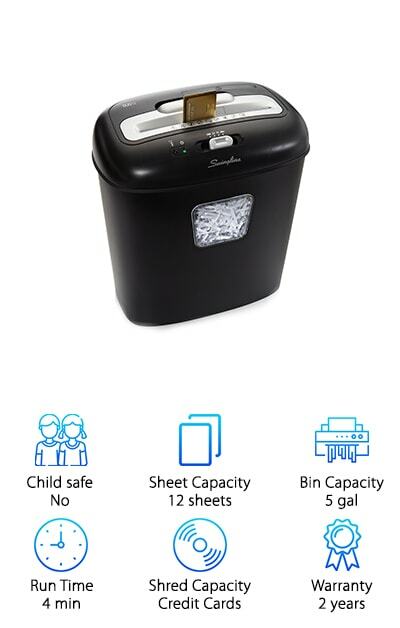 Equipped with user-friendly options, including auto reverse and auto stop and start, the ShredStar features quiet operation and energy management control that reduces power consumption by up to 90 percent. The 7.1-gallon wastebasket pulls out for convenient disposal and wheels allow for easy movement from desk to desk or office to office. 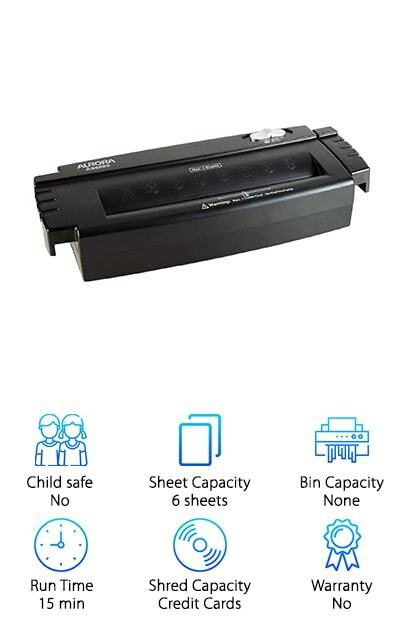 Perfect for any home office, the SimplyShred cuts through 8 sheets at a time and accepts letter-size documents, legal-size paper, credit cards, and staples. Its versatility is ideal for those seeking a sleek, multifunction shredder for a small environment. It creates a crosscut pattern to ensure the utmost security for your sensitive information, leaving paper and plastic alike in tiny pieces. Equipped with an auto-stop feature and a motor reverse function, jams are easily avoided and remedied. A quiet motor lets you shred in style without the interruption of grinding and slicing. The top pops off easily, so you can empty the 4-gallon wastebasket. Even better, a small window allows you to monitor the basket, so you know when it’s time to dump it. 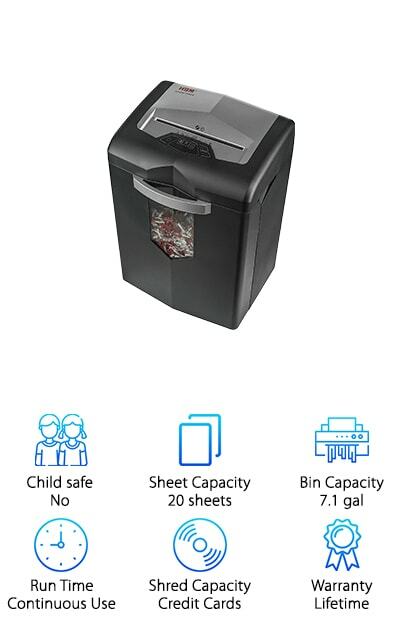 When you’re looking for the best paper shredder brand, it’s a smart move to consider SimplyShred. The GoEcoLife makes our list as a best shredder thanks to its unique carbon-neutral and energy-saving operating system. Kind to the environment, this shredder is energy efficient without giving up all the perks of a great machine. It can shred 12 sheets of paper at a time into tiny, confetti-sized particles. The results are unreadable, ensuring maximum protection for your personal information. Credit cards, CDs, and DVDs are also compatible with the cutters on this machine.Truly, it’s a great multifunction option for anyone seeking a versatile home office shredder. A large 5-gallon wastebasket lets you shred for a good amount of time before it needs to be emptied. The window on the front of the machine keeps you up to speed with how full the basket has become. Even better, the GoEcoLife is quiet and moves easily on wheels, making it a convenient for most environments. If you’re in the market for a shredder and you care about your carbon footprint, you just found the right fit! Shredding up to 10 sheets at a time with a speed of 6.9 feet per minute, the Protek is an excellent choice for those who require a heavy-duty shredder. You can’t go wrong with that level of stamina! The motor cuts through staples and credit cards, so you enjoy a wide range of shredding security options. A crosscut method of shredding ensures level 4 security, leaving your confidential information in unrecognizable, tiny pieces. Features include an overheat indicator light that protects the motor, as well as a 3.3-gallon wastebasket designed with a see-through window. This durable, sleek model is perfect for home or small office use. If you’re looking for a quality shredder that can eat stapled documents quickly and efficiently, don’t overlook this option. Offering users top quality at a great price, you’re sure to be satisfied if you make Protek your pick!